Islamabad, April 11 (Geo News): he Islamabad High Court (IHC) ruled on Thursday that the Ghotki girls are of legal age and were neither forcefully converted to Islam nor married without consent. They were free to return to their husbands, it added. 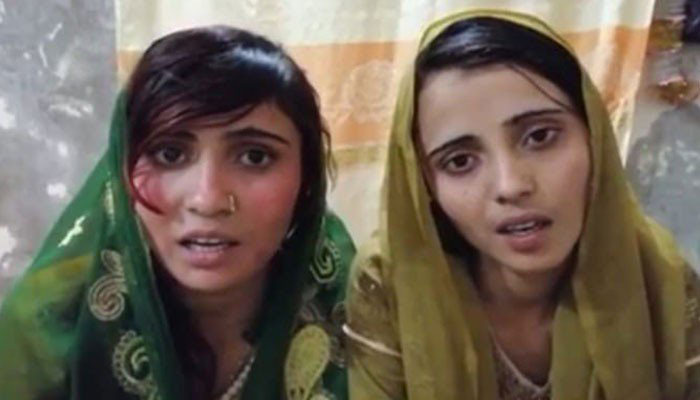 In the hearing on the alleged forced conversion and marriage of Raveena and Reena, the federal home secretary presented a report to Justice Athar Minallah, the chief justice of the IHC, that stated that the Hindu girls — now known as Nadia and Asia — are 18 and 19 years old, respectively. According to the report, three people — including Human Rights Minister Shireen Mazari — met Nadia and Asia, who, at that time, had confirmed that they were not forced to convert to Islam, and, in a statement recorded with the Magistrate, said they married of their own will after the conversion. Their ages, as present in the report, were determined by a medical board formed on the orders of the court. The IHC further mentioned that the girls can make their own decisions given that they are legally adults. For security, on the other hand, the court said they can submit a request to Deputy Commissioner (DC) Islamabad. I.A. Rehman, a member of the court-ordered inquiry commission, said the probe did reveal concerns that there’s an organised group in Ghotki proselytizing Islam and asking them to convert. In addition, the IHC advised the inquiry commission to submit their recommendations to ensure the protection of minorities’ rights. Dr Ramesh Kumar, the patron-in-chief of the Pakistan Hindu Council and a member of the National Assembly (MNA), can also submit written advice until the next hearing, which is slated to take place on May 14, the court stressed.